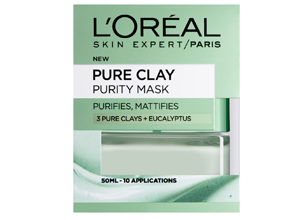 L’Oréal Paris Skin Experts have created a super-charged pure clay face mask for clogged pores with the power of Eucalyptus to purify and mattify your skin in just 10 minutes. The fresh, indulgent eucalyptus skin care formula provides a soothing and refreshing spa-like experience, while powerful pure clays penetrate deep to remove impurities and unclog pores. The Purify & Mattify Pure-Clay Mask addresses your shiny and oily skin to reveal clarified, mattified, and refreshed complexion. Skin looks less shiny and excess oil is reduced. Pores seem tightened and less visible, without over-drying. Available: From selected departmental stores and pharmacies. It is not just a hype. This clay mask is EVERYTHING. My skin was tamed from Mr. Shine. And I was feeling like a brand spankin’ new face doll… Well obviously, I am hyping it up. I may be biased, I just love this product for what it made me feel after application. I will purchase other masks in this range.